So the never-ending battle of Corolla and Civic fans is here again. Who wins it? This is an unsettled dispute yet again as both the models hit the market with great features and shape! The Corolla enthusiasts are going gaga over the magnanimous Toyota Corolla Grande while the Honda Civic fan boys are all praise for the chic Civic. Let’s try and settle this dispute by bringing the titans head on and comparing their features and specifications. These are the key feature of both the cars. Now coming to the negatives, Civic has very complex dash surfaces. Also the brake feels are not smooth and it overall gives a low speed hybrid feel. The look is not new and resembles the previous models. On the other hand, we have Grande that lacks in modern safety features, has a constricted head space at the back and the CVT models give a sluggish feeling from a stop. 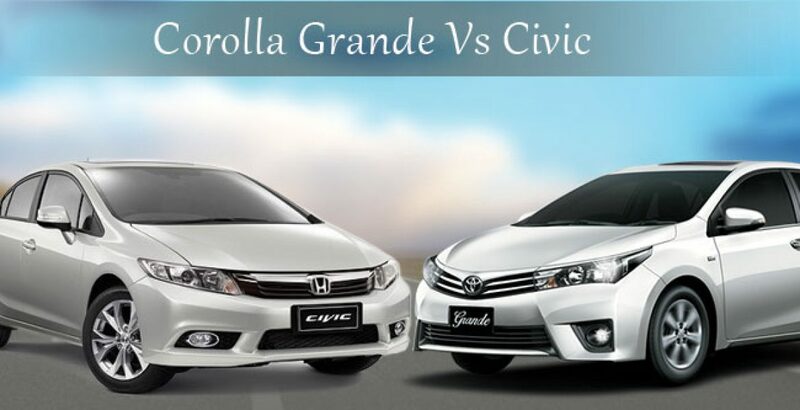 Apart from these features, Grande is wider and measure more in height and length as compared to Civic. Grande has leather seats which are not present in Civic. Civic has carried forward the legacy of elegance and class with great value for money. Corolla has always been a safe bet as a family car as it has a better fuel consumption but this time it has come with a whole new look and concept of reimaging itself as a stylish and modish car. Although there is not much difference in price, it’s for sure that there will be a lot of difference in the drive and feel of both the cars. Both the cars are getting mixed reviews as the fan following is quite strong on both ends, but these two cars this time are giving each other a cut throat competition. So what do you think? Which car would you like to own? If you are the kind of a person who constantly wants change, then you should straightaway head for Corolla. Grande with the completely revamped look will intrigue you but if you want to keep the same features and shape and just improvement in quality, Civic is your safe choice!